Transfer by Taxi from Podgorica airport to Perast is among the most common rides for all categories of tourists. This small place in Boka bay is one of the most beautiful jewels of Montenegrian coast line. Transportation from Podgorica airport to medieval Perast can be reserved at your request 24h daily. Our wide range of ways of booking allows you to do it on the way that suits you the best. Fixed price of 65 Euros is valid through the year, and apply per vehicle maximum four persons. You can use the form established on our website, or official email address. If you want to schedule safe and cheap taxi from airport Podgorica to Perast by phone call, please use the phone number listed on the site. Any way you select, communication in Montenegrin and English language is constantly accessible. If you want to travel from Podgorica to Perast safely and cosy, we promise that our chauffeurs will provide you with best service in Montenegro. Our premium cabs are comfortable and with a lot of space in the trunk. Transportation by our taxi directly from airport Podgorica to Perast at the price of 65 € is very economical. Travel price includes all road tolls and passenger insurance. Perast is perfect place to enjoy in vacation, especially for people who want peace and for the history lovers. This small town is the oldest settlement in Boka bay, and it has been proven that people lived here 3,500 years before Christ. Transportation by bus from Podgorica airport to Perast is not possible, taxi remains the only option. But if you insist to travel by bus from airport Podgorica to Perast, first you have to reach Podgorica bus station, than Kotor and then local bus to Perast. 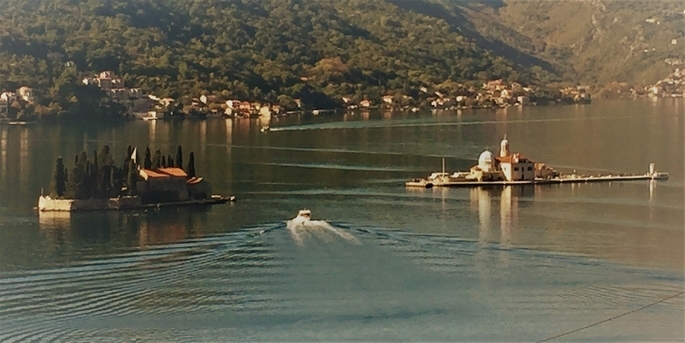 Perast adorn two small islands, St. George island and Lady of the Rock. They are easily accessible by small boats which are during the season every 15 minutes operating in both directions. Perast is at this moment the best preserved cultural and historical city on the Montenegrin coast line, and that is one of the most important reasons why taxi rides from Podgorica airport to lovely Perast is so popular transfer.